Few people know-and still fewer can remember-that the famous industrial engineer arid inventor, Thomas A. Edison, was once interested in and for a short period (1889-1891) regularly visited Berks County. The source of his interest was not electricity but Berks iron deposits, which have had consistent value to the nation from the Colonial and Revolutionary War periods, when they ranked first in the country, until the large-scale mining of Berks iron recently instituted by the Bethlehem Steel Company at Grace Mine near Morgantown. As one would anticipate, the great inventor’s primary concern was not in the iron per se, but in experimenting with and improving a process of extracting the metal from low-grade ore.
About 1885 American industrialists began to worry about what would happen when the Great Lakes and other sources of high-grade ore were exhausted. At this time Edison turned aside-his major discoveries in electricity having been completed-and made a comprehensive survey of iron deposits in the East. Most of these were low-grade deposits. Then he began a long series of experiments in getting iron from such deposits economically. Between 1890 and 1900 he developed a concentrating process, for which he made many significant inventions. One of his biographers, William Adams Simonds (Edison, His Life, Works, and Genius, p. 257), states: Into his mind came a gigantic idea-the use of his ore-separator and stamp mill on a huge scale, reducing mountains literally to dust from which the particles of iron would be separated. Having arranged to secure the property, he planned a survey of the whole eastern region. A crew of young men were equipped with magnetic needles and sent out to cover a strip twenty-five miles wide, commencing at the Canadian boundary and terminating in North Carolina. The surveyors worked across the twenty-five-mile strip at intervals of one thousand feet, and kept minute records of their observations for study on Edison’s return from Europe. Simonds dates this intensive survey as the summer of 1889, at the end of which Edison returned from the Centennial Exposition in Paris, where he had received high honors for his achievements in electricity. Although none of Edison’s many biographers who describe his “Iron Period” makes specific mention of his Boyertown-Bechtelsville venture, the date 1889 is important in our story. On it we base our conjecture that some of his inventions in the concentration of iron ore may have been made, tested, or perfected in this early Berks County laboratory. Legal evidence of Edison’s presence here and ownership of property can be found in the office of the Recorder of Deeds at the Court House in Reading. The most important of these deeds, dated July 24, 1889, transfers from Abraham Benfield to Thomas A. Edison five acres (from Benfield’s farm) for a consideration of $1500. Another deed, dated July 1, 1889, transfers two plots of nine and one acres each from George G. Greiss to Edison. Both deeds conveyed land in Washington Township in the vicinity of Heydt’s School House, which is situated near Bechtelsville and about eight miles north of Boyertown. On the Benfield plot, Edison established his mine and ore concentration mill. Interestingly, though Edison entrusted most of the comprehensive survey (referred to above) to a corps of assistants, he made a personal investigation of the Boyertown area. From Harrison Reidenauer of Bechtelsville, once an employee in Edison’s mill, we have a description of the inventor, then in his early forties, as a “fine looking man.” And Reidenauer remembers first seeing Edison when he went to Frank Leidy’s livery stable in Boyertown and got two horses, a wagon, and a driver. Then with his male secretary (perhaps Alfred 0. Tate, his confidential secretary and later biographer), Edison proceeded to scour the countryside using the magnetic “dip needle” (his invention) to locate magnetic iron deposits. Edison’s engineer, Reidenauer relates, followed on horseback, riding Frank Leidy’s saddle horse, Dolly. The results of Edison’s survey must have been satisfactory, for in addition to purchasing the tracts of land from Benfield and Greiss, the inventor also secured leases from both men to select and purchase more land. Benfield’s lease will suffice as example. It granted Edison the exclusive right “to explore, excavate, and carry away the minerals and to acquire by deed a fee simple title to any portion of the premises, except that occupied by the buildings, upon payment of sixty dollars for each acre.” Thus Edison apparently planned to extend his mine should the Bechtelsville experiment succeed. A still further deed transfers the five acres purchased from Benfield from Edison and his wife, Mina M. Edison, to the New Jersey and Pennsylvania Concentrating Works of Orange, New Jersey-Edison’s operating company for the gigantic enterprise which was to follow, a few years later, in New Jersey. What is the significance of the deeds? First, we know that the New Jersey and Pennsylvania Concentrating Works was incorporated in New Jersey on January 3, 1889. That establishes a beginning point to Edison’s intense interest in iron. Second, the comprehensive survey was made in the summer of 1889, and the report was given Edison on his return from Paris. But the deeds, showing purchases in July, prove that his personal survey must have been made before this purchase, perhaps in the spring of 1889 or earlier. Thus Berks must have been one of the first areas to engage Edison’s interest. Why the great inventor’s interest turned to this specific part-the Boyertown area-of the vast iron deposit that extends throughout southeastern Pennsylvania, we cannot precisely determine. But we can offer several plausible explanations. 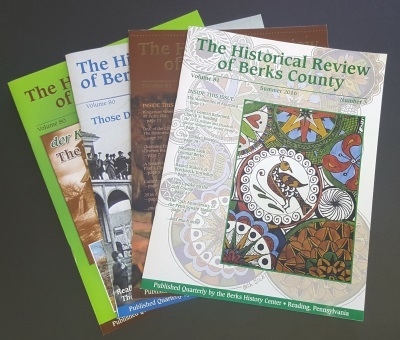 First, this area had one of the earliest iron mines in the Western Hemisphere, a mine known to William Penn as early as 1683 (see “The Early Iron Industry in Berks” by Thomas W. Leidy, Historical Review of Berks County, Vol. XXIII, No. 1); and as the area was not being actively mined in 1889, there would be iron land available for purchase. Second, the deposit general to the region divides in this section into two layers-small “pockets” near the surface ( thus easily mined for his experiment) and a larger, continuous bed of iron at a deeper level (where it could be reached and would provide an adequate supply, should the experiment be successful). And finally- perhaps the most important of all-this area lies close to the coal deposits of Schuylkill County. With canal and railroad nearby, this factor offered cheap transportation of fuel-the largest expense in processing iron. Before we describe the Bechtelsville mine, a l)rief outline of the so-called “magnetic concentrating process” may clarify the problems which confronted Edison at this period. The magnetic process was known and used before Edison. It sufficed to produce iron for the local foundry, but ore produced by this complex process was too expensive to compete with the high grade ore of the Great Lakes region. In Edison’s perfected process, the raw ore, as taken from the mine, was ground into a powder, then passed down a chute beside which stood a permanent-type magnet (or a series of them). The “gangue,” or sand and refuse, fell directly on a conveyor-belt beneath; the finely ground iron particles were attracted toward (but not to) the magnet and fell upon another conveyor-belt, which carried it to containers for the finished product, concentrated iron ore.
Edison’s major contributions to the process were the conveyor-belts, the giant roller-grinders, and (much later) a huge crane to lift the loosened rock into the first huge roller-crusher. The purpose of the concentration, or magnetic separation, was to reduce the cost of transporting ore to the furnace and to facilitate the smelting. The roller-crushers- which Edison increased in size with every venture-effected a further economy in the use of dynamite and in the labor of blasting. In the early process, dynamite was used to break the rock into smaller particles; later, Edison minimized this expense by developing crushers which could pulverize huge boulders. For a description of Edison’s Berks County mine, one of the authors turned to William H. Reifsnyder, Jr., of Boyertown, who referred him to Harrison Reidenauer of Bechtelsville. Aged 85, Reidenauer is one of the few people still living who participated in the erection and operation of Edison’s mine and concentrating mill. At the age of 15, Harrison Reidenauer assisted his father, William B. Reidenauer, who had contracted to move the lumber used to construct the buildings at Edison’s mine. Most of the lumber was bought in Boyertown, but the larger pieces came by train and were moved by wagon from the freight station at Bechtelsville to the mine site. Reidenaner also remembers hauling two enormous steam boilers required to operate the grinders and conveyor belts. Central to the process was a huge nine-ton permanent-type magnet. Mr. Reidenauer recalls the labor involved in moving this mammoth magnet from the railroad station at Bechtelsville to the mine. He describes its dimensions as 2′ 2 feet thick, 9 feet long, and 5 feet wide. Eight horses were required to pull the long logging wagon that bore this giant to the mine. The magnet was so powerful, he said, that it could pull in a pocketknife at 18 inches. The operation of this mill is described by Reidenauer as follows: A man by the name of Greiss (probably the same man who had leased and sold other land to Edison) held the contract to excavate the ore from this mine, which was located on a bill. Greiss, who also operated an ore mine at Rock Mine Hill, Siesholtzville, thus already had experience in mining. The mining was done with hand drills and the blasting with dynamite. The rock loosened by blasting was raised to the surface by a hoist operated by a horse. On reaching the surface, the ore was loaded on a wooden sled and pulled downhill by a horse to the mill. Young Reidenauer and his father worked at this part of the operation. The mill building of lumber, an impressive structure for its day, evoked the curosity and pride of the neighborhood. Inside the mill were huge stone crushers which were operated by steam engines from boilers fueled by coal. The ore as it came from the mine passed through a grinder, whose jaws moved back and forth. Next it passed through a series of rollers which reduced it almost to a powder. The groundup rock was conveyed on a belt to a chute through which it dropped beside the giant magnet (described above as central to the process). The gangue (sand and refuse) dropped directly to a conveyor-belt below; the iron ore particles, drawn by the magnet, were deflected to one side and dropped to a second conveyor-belt. (Observe how closely Reidenauer’s description resembles Edison’s biographers’ description of his perfected process). At the time of the mill’s operation, a sand pile 75 feet high had accumulated and extended almost to the public road, but no trace of the sand is left today. The mill building and its foundations have long since gone. The only remains extant are the foundations of a horse stable which Edison started but did not complete, and the minehole, a few hundred yards up the hill (see illustrations). Testifying to Edison’s high-seriousness about his work, Reidenauer remembers that on one occasion, when Frank Leidy, Bill Grim, and Jerry Muthard gathered at the Union Hotel in Bechtelsville to hold a celebration for Thomas A. Edison, the famous inventor slipped out of the back door before the celebration got under way, saying that he was there on business, not for pleasure! The co-author’s father, Thomas K. Leidy, Esq., who spent his childhood in Boyertown, often told of going to Frank Leidy’s livery stable to watch the special currying of horses that were to be used by Thomas A. Edison, whose arrival always was a big event for this quiet rural community. Edison’s concern for his employees was evident in the numerous safety gates and protective devices around the moving belts and the crushing machinery. But despite all these preventive devices, Reidenauer recalls, one horrible accident occurred. A workman, Phillip Dougherty, who had removed the safety gate and was greasing machinery near one of the stone-crushers, slipped on some grease, fell into one of the roller-crushers, and was ground up so small that his remains had to be gathered in a bed sheet. Harrison Reidenaner was the man who was sent for the doctor. Only two years elapsed between the opening and the closing of Edison’s Bechtelsville mill. The local explanation for the closing was that it had failed to produce concentrated ore at a competitive cost. But, the authors feel that, since the giant magnet, the stone crushers, and the conveyor belts were already there, it is reasonable to believe that Edison felt he had licked the major problems in this miniature laboratory and was ready to begin the mammoth expansion at Ogden. Most of his biographers begin the “iron period” of his major inventions in magnetic ore concentration from this very year, 1891, when he closed the Bechtelsville mill. Interestingly, too, Edison did not sell his properties in Berks until 21 years later. Why did he hold the Berks County property even after the colossal Ogden project failed? Another possible explanation for the closing of the Bechtelsville experiment is that, having developed the processing on relatively richer ore, Edison wanted to apply it to the larger deposits of lower-grade ore-the true objective of his plan. Before we go on to the description of the Ogden enterprise, it might he interesting to explore briefly the reasons for Edison’s “iron period.” Though it is risky to divide the multiple facets of this genius into periods, his work in electricity had reached its culmination in 1889. He had begun experiments with sound recording, the phonograph, which originally was intended not as an instrument of pleasure and entertainment but as a practical device to take down oral dictation in the business office. In this trying period, the early forties of his life he had failed to secure financial support for the new recording machine; and his first and greatest love, electrical invention, had disappointed him. According to Alfred 0. Tate (Edison’s Open Door, pp. 260-266), Henry Villard had negotiated, through Morgan and without the knowledge of Edison, an amalgamation of the Edison General Electric Company (valued at 15 millions) with the Thompson-Houston Companies (valued at 17 millions). This amounted to an absorption, for the latter and larger company would control, and Edison’s name was dropped from the amalgamation, which became the General Electric Company. Adding insult to injury, in one newspaper account a statement was accredited to Henry Villard to the effect that the cause of the amalgamation was “the impaired financial condition of the Edison Company, due to the extravagant management of Mr. Insull” (Edison’s friend and esteemed collaborator!). Edison sold out his interest in the Edison General Electric, and 18 years of litigation followed. This part of Edison’s story has no place here except perhaps to explain the furious energy which Edison devoted for five years to the concentration of magnetic ores-a new field for him. At the scene of the blasting the rock was loaded on skip cars, carried by gravity downgrade, and broken into smaller pieces through five sets of rolls, of which the largest were six feet in diameter-their moving parts weighing about seventy tons. The giant rolls, “rock-crackers,” had to be seen and heard to be appreciated. It was only as one might stand in their vicinity and hear the thunderous roar accompanying the smashing and rending of massive rocks as they disappeared from view, that the mind was overwhelmed with a sense of the magnificent proportions of the operation. The broken fragments next fell into an intermediate set of rolls four feet in diameter, then through two sets of three feet, and a last one of two feet, whence they were transported by conveyor to an adjoining mill to be pulverized by “three-high rolls” to the consistency of fine sand. After screening, the particles were lifted to a tower and dropped past magnets in a fine stream, the ore being drawn off to one side and the sand passing on. For five years Edison worked at the new project. When a test of the briquets had indicated considerable increase in yield, Edison began to plan a still larger works in a more favorable location. The cost of coke presented an obstacle to eastern steel manu- facturers. By erecting a plant nearer the fuel deposits of eastern Pennsylvania, Edison hoped to lower transportation costs. Did Edison remember his Berks County holdings at this point? With proximity to the coal deposits of Schuylkill County, with railroad and canal close by, with the assurance of an adequate supply of medium-grade ore, Berks might well have proven the answer to Edison’s need. But we shall never know the answer to this question. For alas, even while he planned, the enterprise was threatened. The Pittsburgh steel baronsCarnegie, Phipps, Frick and Schwab-were able to ship their ore more cheaply than Edison could extract it. They cut the price of pig iron to ten dollars a ton, dangerously near to Edison’s production cost. His Colossus tottered and fell. Edison closed the concentration works in which he had invested an estimated two million dollars– three quarters of which he put up personally from proceeds of his sale of General Electric stock. His final comment (Simuonds’ Edison, P. 276) was, Well, it’s all gone, but we had a hell of a good time spending it !” Though Edison’s inventions in ore concentrating contributed much toward the methods currently used, the only item of immediate value to himself was the titan roller-crusher, which he turned to use on his next project, Portland cement, for which it is still used today. All this happened in the late 90’s. But Edison did not sell his Berks County holdings until much later. A deed on record as of November 18, 1909, transfers from Thomas A. Edison, his wife, and Dr. Henry K. Hartzell, of Allentown, Pennsylvania, to Levi Gilbert two plots of nine acres and one acre each-the land originally bought from Greiss. Another deed of March 10, 1913, transfers from Edison and his wife to Abraham and Daniel Benfield for $50 the same five acres which Edison had so hopefully purchased for $1500 twenty-four years earlier. If we work upon marble, it will perish; if we work upon brass, time will efface it: if we rear temples, they will crumble to dust; but if we work upon immortal minds, if we imbue them with principles, with the just fear of God and love of our fellow men, we engrave on those tablets something which will brighten to all eternity. Thus the great man came, saw, and conquered the early obstacles that confronted him in the concentration of iron ore, then left. But you can still measure the immortal dimensions of his mind, seventy years later, in the memories of those who once knew Thomas A. Edison. This article originally appeared in the Fall 1958 issue of the Historical Review of Berks History.